Knickernappies Sightings! Sales, Giveaways, Stockings and more! 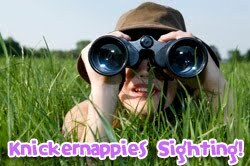 Time for some Knickernappies Sightings! Giggle Britches going out of business liquidation sale! This week only save big on name brand cloth diapers including Knickernappies. Enter to win a Knickernappies Onesize Diaper from Simple Wonders over at the Fine and Fair Blog! Giveaway ends 01/27/11 and there are many great and easy ways to enter! Good Luck. My Baby Pumpkin has restocked some of their Knickernappies products, Just Hemp Inserts, Nursing Pads, Mama Cloth, Baby Bum Drops and more! Enter to win a Knickernappies Onesize Diaper from WeeLittleChanges! Giveaway ends 01/27/11. Don't miss your chance to win this great onesize diaper with loopydo inserts! Free Shipping on ALL USA orders at Cloth Diaper Outlet, includes Knickernappies products and more! Free Shipping on orders over $50 at Nature's Nappies, also includes Knickernappies products! Do you have a Knickernappies Sighting to tell us about? Post a link to it on our FaceBook Page and we'll check it out.